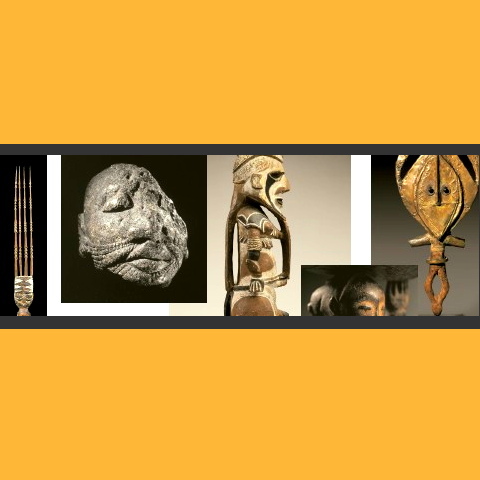 The Parcours des Mondes tribal art fair in Paris has been a fixture on the calendars of dealers, collectors and connoisseurs for seven years now. Each year it has expanded and diversified, and this year is no exception. More exhibitors, more spaces. And new directions. Contemporary art and photography are categories newly added to the fair’s repertoire. In this vein, there will be an exhibition of important 20th century artists whose work was informed by a primitive aesthetic. The latter will be held at Galerie Jeanne-Bucher, which during the run of the Parcours fair will be reserved exclusively as a VIP space, exclusively for important collectors, exhibiting dealers, academics and other art professionals. Who gets to be on the VIP list isn’t clear. After Parcours has closed, the exhibition opens to the public, through 4 October. Parcours has updated their website for the 2008 fair at last, adding English language pages and additional information on exhibitors and special themed exhibitions taking place as part of the fair. We’re a bit dismayed to see that of the fifteen themed exhibitions, not one focuses on the arts of Asian or Oceanic cultures (with the possible exception being a show of contemporary photography from archaeological sites in Easter Island and Laos, although the art offered in this context is the photography, not its subjects). The Afro-centric tendency of Parcours seems irreversibly entrenched, despite the fact that 42 of the 63 exhibitors are dealers in non-African art. Why is that? Download the list of exhibitors here, which lists their specialities, addresses and email addresses (but not their URLs, oddly enough). As a footnote, we expect there will be lashings of champagne and caviar in the VIP venue (Galerie Jeanne Bucher). Why? On the list of Parcours partner/sponsors, which is not presented in alphabetical order, Galerie Jeanne Bucher, Caviar Petrossian, and Charles Heidsieck appear side by side in consecutive order, and there are no other food or beverage sponsors. Get on that VIP list, by all means.